Soft and durable it is a perfect decoration for a stylish home, office or hotel. 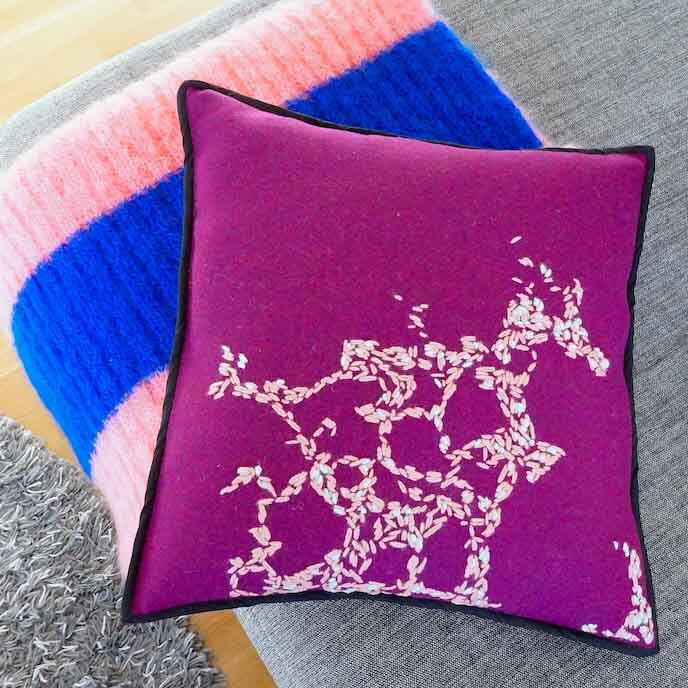 This handmade cushion cover is a part of my ‘culture’ collection where decorative embroidery is inspired by bacterium-style patterns. 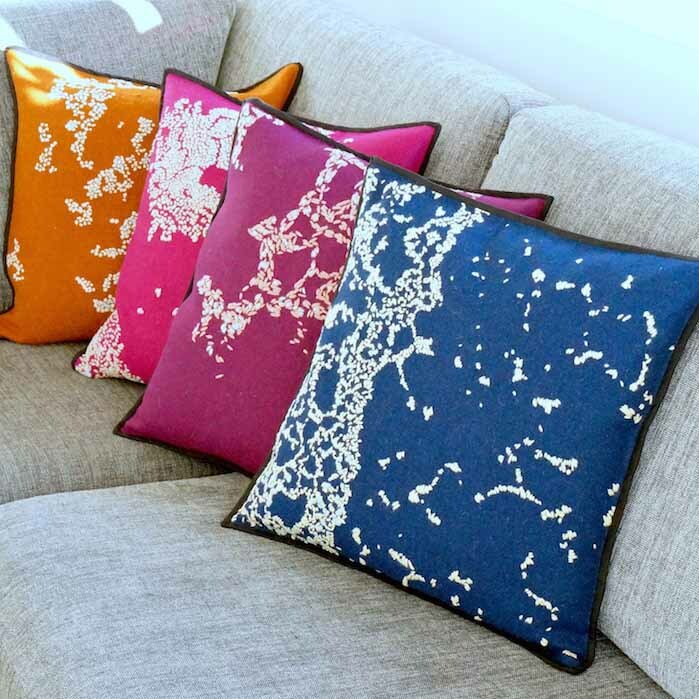 This handmade cushion cover is a part of my ‘Culture’ collection where decorative embroidery is inspired by bacterium-style patterns. Soft and durable it is a perfect decoration for a stylish home, office or hotel. All items in this collection are made of Harris Tweed, a cloth hand woven in Outer Hebrides of Scotland from pure virgin wool. This is truly luxurious and iconic fabric. The cover is secured with a zip, lined inside with cotton fabric and finished with hand-sewn black edging tape. 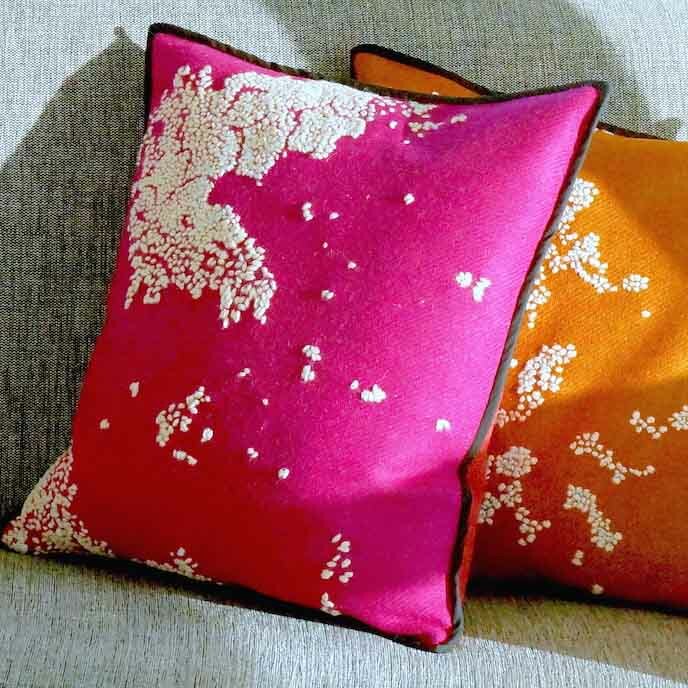 Due to the hand embroidery technique used for decoration, no two pieces are the same. All Hebridoodle products are unique and original. Please allow for minor variations from the image presented here. 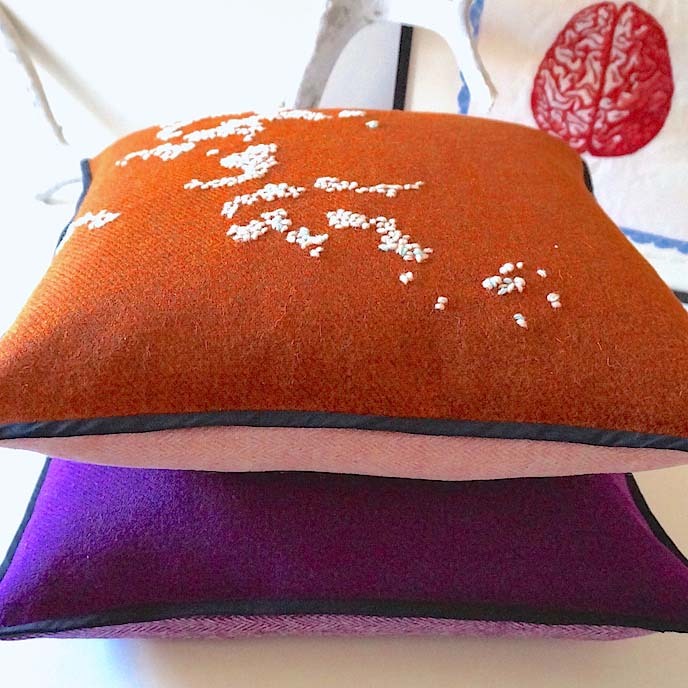 In this limited edition there are three other cushion covers each in bright, bold colours, which complete the look. My name is Sylwia, I was born in Poland, but now I live in Arctic Norway. Before moving to Bodo I spent twelve years in UK, first in Liverpool, then Edinburgh and then the Isle of Lewis. My background is in art conservation. I have a Master of Art Degree with a specialisation in the Conservation of Sculpture and Architectural Details. During thirteen years of my professional practice I had the chance to care for amazing artworks. I also learnt to appreciate the value and power of handmade works. The story behind Hebridoodle started in 2015 when following my partner's new job, I moved to the Outer Hebrides. I found myself looking for employment; given opportunity to make a fresh start and do something creative I decide to make a career out of my passion and hobby, embroidery. In a world flooded with mass-produced and disposable items I am offering an alternative; hand crafted and unique pieces made with high quality materials. Every item I produce is embellished with hand embroidery, colour combinations and details differing from one to another. I always have a design in mind but improvise during the production process allowing the work to develop. I like to work at the crossroads between arts and crafts. The main ambition of mine is to create beautiful objects, but it is really important that you can actually use the things I make. True to my background I am inspired by art, history, science and nature. During my time in Isle of Lewis I become fascinated with Harris Tweed, its story and role in life of local community. The islanders are still weaving this luxury clothe by hand in their homes in Outer Hebrides. This fabric has long been known for excellence, beauty and durability. Over decades Harris Tweed was embraced by world; from royalty and land gentry to Hollywood icons and the finest designers of couture. Since moving to Norway I have been discovering the Norwegian heritage in working with wool. One of the oldest and most significant woollen cloths in all Scandinavia is Vadmel. Such was the importance of this fabric that it was accepted as a currency. Vadmel become an obvious choice for my first Norwegian collection. In my works I like to mix traditional materials and craft technics with modern design. In “Culture” collection all items are made with Harris Tweed and are decorated with traditional hand embroidery. Modern twist is in decorative patterns; they are inspired by microscope photography of bacteria and viruses. Colours are very important to me, they can express different moods and feeling, evoke emotions. In “Culture” I take advantage of bright coloured modern pallet of Harris Tweed, it fit perfectly to stunning microscopy images. In “Norwegian winter” black and white colour scheme refer to wintery conditions: long black nights and blinding whiteness of a snowy landscape. 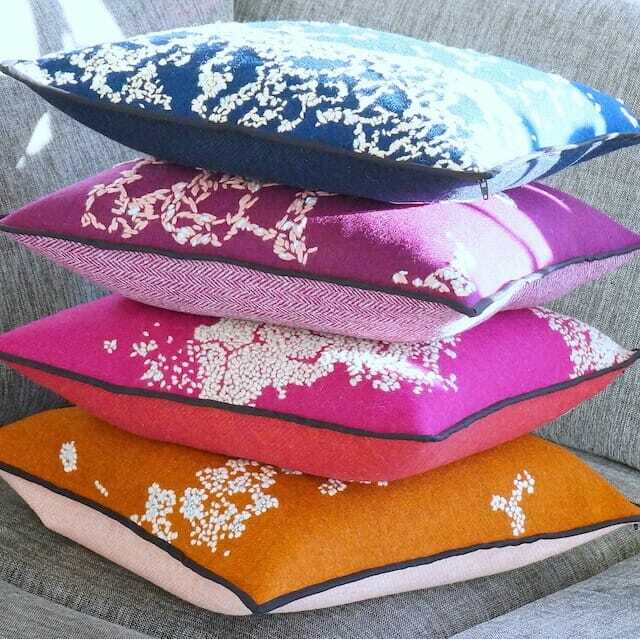 In my designs I am always playing with colours combinations.